First Disney makes princess movies that put their own spin on classical fairy tales, then those movies inspire countless little girls at playtime and inventive artists to give it their own spin from there. For one movie lover, it meant making a mash-up trailer that cast Cinderella, Snow White, and the Evil Queen in the brilliant dark comedy about the dark side of beauty pageants Drop Dead Gorgeous. For one bride and her clearly devoted wedding party, it meant the most epic wedding day cosplay ever. And for Deviant Art contributor Claire Hummel (A.K.A. *shoomlah), it means re-imagining these princesses in historically accurate regalia, like the one seen above. A graduate of Rhode Island School of Design, Hummel works as a Concept Artist at Microsoft Game Studios when she's not researching period costumes and adding to her online gallery. 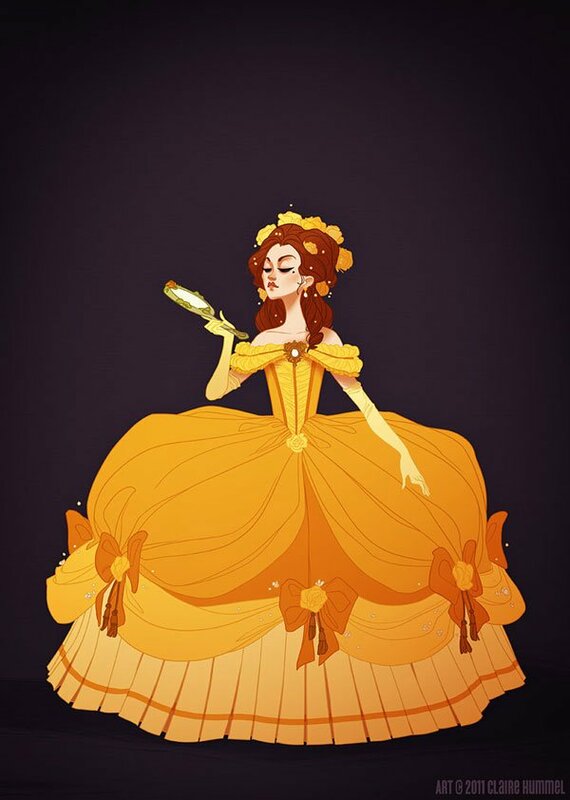 To date she's done revisions of Beauty and the Beast's Belle (up top in 1770's French court fashion), Sleeping Beauty's Aurora, The Little Mermaid's Ariel, The Princess and the Frog's Tiana, and many more. And yes, she assures in her FAQ, a Merida makeover is coming soon. (And that one will likely be more welcomed than Disney's controversial revision.) Hummel admits these aren't 100% accurate--more like 85-90%--but by our count there are still pretty damn cool! You can check out her full gallery here, but we've posted some of our favorites below. 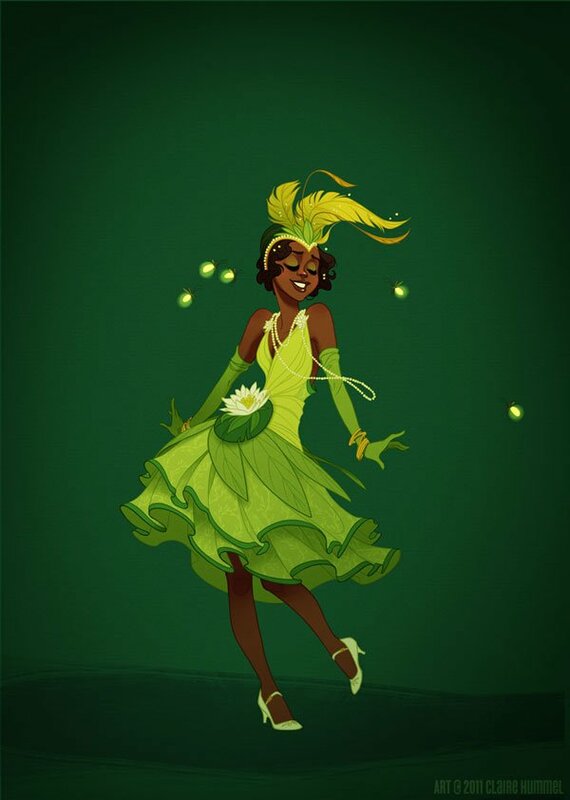 Set in the 1920s, Tiana's dress has a flapper's flair in the vein of Lanvin's robes de style. 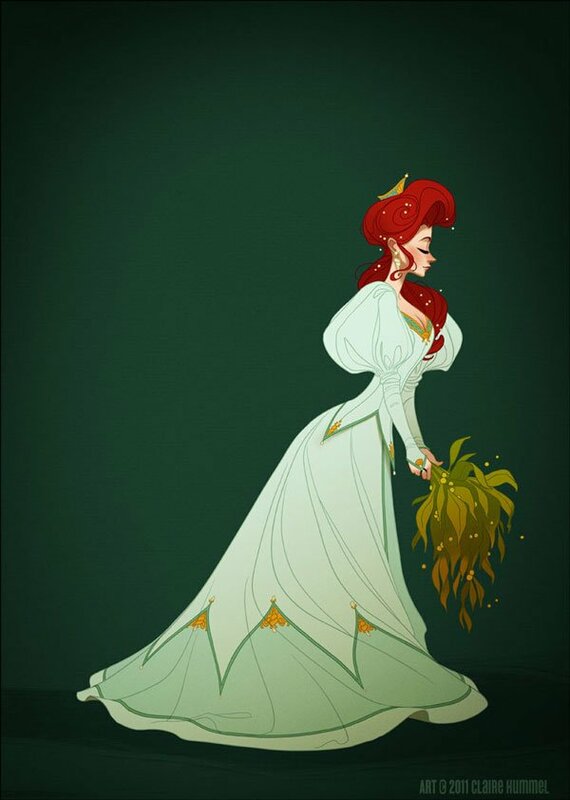 Pulling visual clues from Disney's The Little Mermaid, Hummel decided Ariel's wedding dress would be from the late 1890s. Re-conceived here, its insanely luxurious, topped off with a Gibson girl hairstyle and seaweed bouquet. 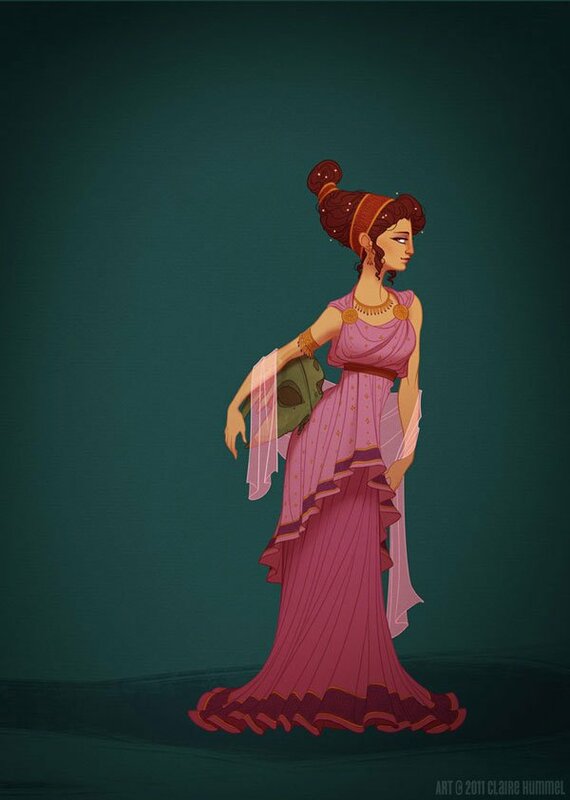 Rather than the very sharp and lanky design bestowed on Hercules' Meg, Hummel embraced a more classic Roman look with upswept hair and a simple doric chiton (translation: robe). Ha ha! 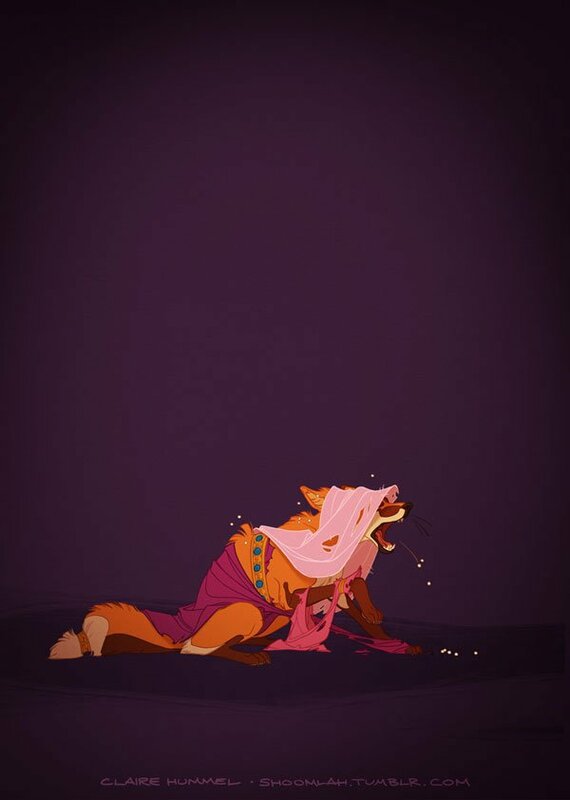 It's Robin Hood's Maid Marian! Lastly is Hummel's second take on Pocahontas. 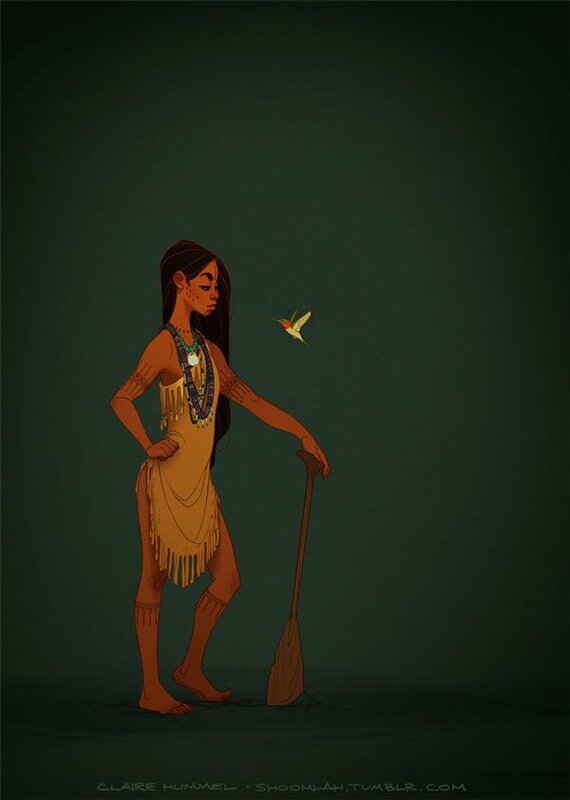 The first one showed the Native American princess as the age the Disney movie made her, but this one has the historical icon at the more historically accurate 12 years old. Even at that age, Pocahontas has no time to suffer fools. Take a look at the gallery and tell us your favorite revision in comments.